David wrote this 3-part converging song for large groups of students to sing during literature-based songwriting residencies. The introduction is a rhythmic version of the 3 vocal parts, composed entirely of “book” sounds. Billy Jonas helped us out singing the third vocal line. 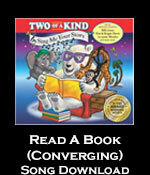 Thanks to Joanne Hammil for introducing us to the idea of converging songs. 3. I love to read a book - it's so much fun!